Koottathil Oral malayalam movie directed by Padamkumar Krishnan Nair will have Siddique and Soja Jolly donning lead characters. The movie is being produced by Meenakshi Ramji under the banner Souparnika productions entertainments. Divya Darsan, Rajasree Nair, Sadique, Chali Pala and Chemban Vinod will give life to other important characters in the movie. G K Nandakumar stays behind the camera as the cinematographer. With the final cut, 'Koottathil Oral' will reach theatres very soon. There had been a number of movies made in malayalam which are creamed with real life situations. Those movies had got well reception at the box office as the movie enthusiasts received it whole heartedly. It is the skill of the writer and director to keep the audience intact with the lively script on screen. Padamkumar Krishnan Nair is gearing up to deliver an extra ordinary theme keeping in mind of the family audience. Titled 'Koottathil Oral', the movie is family oriented subject which revolves around the life of a father and his daughter. Vismaya(Soja Jolly) is an young poet, an activist and very bold girl having healthy relationship and too much attached between them. The relationship between the father and daughter is the core subject which holds all the essence of rapport. Siddique and Soja Jolly are donning lead characters while Divya Darsan, Rajasree Nair, Sadique, Chali Pala and Chemban Vinod will give life to other important characters in the movie. G K Nandakumar stays behind the camera as the cinematographer. The movie is being produced by Meenakshi Ramji under the banner Souparnika productions entertainments. 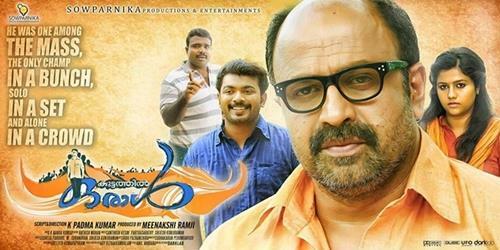 K Padmakumar has also written the story and screen play of the movie. 'Koottathil Oral' is blessed with the presence of Santhosh Kesav, Shijesh Kunji Raman, Parathasarathy who will set the tunes for the movie. With the final cut, 'Koottathil Oral' is slated to release on 17th September. Young Soja Jolly who had made name as an anchor is getting busy with a number of projects in kitty. After debuting on silver screen with Diphan's 'SIM' (Sorry I am Mad), she was blessed to work with 'Sound Thoma' and 'Left Right Left'. Her upcoming movie will be Kanchi which would reach theatres soon. With the full support from the family audience, Soja is hoping to keep her foot strong in the industry.